Createspace Independent Publishing Platform, 9781544240039, 350pp. "(O)ne of the most interesting books you'll read this year," (IndieReader Reviews - 4.7 of 5 Stars) WATERSHED is a dystopian thriller about a troubled, pregnant woman, and the two men-a snake dealer with a sideline in secret messages and a billionaire living under a false name-who vie for her. Their struggle leads them through a near-future America of anti-technology neighborhoods and illegal hospitals, where stockbrokers moonlight as assassins, nurses procure obscure pleasures, and the powers that be blow up the new World Trade Center to goose tourism. As the mystery deepens, one thing becomes clear - the future's about to be born... but who will change the diapers? "(R)eaders will never be quite sure what lurks around the next corner... An appealing mix of adventure and contemplation. "- Kirkus Reviews"(T)he world of WATERSHED is a vibrant one, packed to the gills with absurd and yet oddly-believable detail - everything from a September 11th memorial service that involves a full-scale recreation of the original terrorist attack, to a man who gets off on being locked in a coffin with a bag full of cats... Dodds manages to make all this and more seem not just possible, but vivid and tangible too.... It's the real deal...a strong contender to be one of the most interesting books you'll read this year." - IndieReader Reviews (4.7/5 Stars)"The masterfully dystopian WATERSHED unpacks the future of a modern America that, while spectacular, nobody was expecting... It's a future that, as Leonard Cohen sang, is murder. 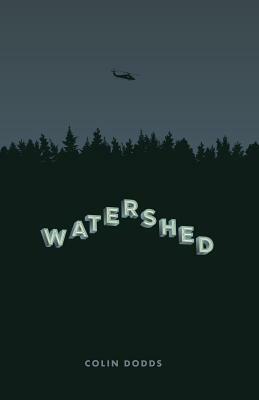 The revelations of prose in WATERSHED makes that murder enjoyable... one of the few things worth believing in. "- Two Thirds North. Colin Dodds is a writer. He grew up in Massachusetts and completed his education in New York City. He is the author of several novels, including WINDFALL and The Last Bad Job, which the late Norman Mailer touted as showing "something that very few writers have; a species of inner talent that owes very little to other people." His poetry has appeared in more than two hundred seventy publications, and has been nominated for the Pushcart Prize and the Best of the Net Anthology. The poet and songwriter David Berman (Silver Jews, Actual Air) said of Dodds' poetry: "These are very good poems. For moments I could even feel the old feelings when I read them." His book-length poem That Happy Captive was named a finalist in both the Trio House Press Louise Bogan Award and the 42 Miles Press Poetry Award. And his screenplay, Refreshment, was named a semi-finalist in the 2010 American Zoetrope Contest. Colin lives in Brooklyn, New York, with his wife and daughter. You can find more of his work at thecolindodds.com.